Quentin: What do you want to know about rockets? In 1957, the initial launch of the Soviet satellite Sputnik shocked the nation and inspired countless youngsters to dream of taking rockets into space. One of these dreamers was Homer Hickam (Jake Gyllenhaal), a 17-year-old living in the small town of Coalwood, West Virginia. This town offered limited opportunities to young men following graduation, with most working at the coal mine. The few that escaped to college had received football scholarships, and academics received little attention, even from the school principal. Viewing Sputnik in the night sky that October, Homer longed for a new route that differed from the limited opportunities in Coalwood. 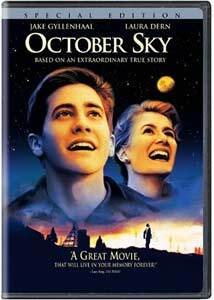 Based on a true story, October Sky chronicles the exploits of Homer and his fellow Rocket Boys�Quentin Wilson (Chris Owen), Roy Lee Cook (William Lee Scott), and Sherman O�Dell (Chad Lindberg). They endure countless failures as they attempt to create and shoot off rockets, but each mistake leads them closer to achieving success. Their eventual triumphs energize the town and make celebrities of the Rocket Boys, but they also earn the ire of some more close-minded figures. The police immediately suspect them for setting a forest fire without evidence, which could bring an end to the boys� aspirations towards college. Homer�s primary difficulties occur with his father John (Chris Cooper), who directs the mine and believes his son should follow in his footsteps. Both are passionate about their opinions, which lead to some heated arguments. John does care for his son, and is not a bad guy, but he cannot understand why the boy would throw his life away. Homer wants desperately to please his father and tries to become a miner, but he can�t push back the larger hopes that reside within his heart. His main support comes from Miss Riley (Laura Dern), a young teacher who truly believes that the Rocket Boys might be able to escape the town�s cycle. If they could win awards at the National Science Fair, college scholarships are guaranteed for all of them. The ultimate result is never really in doubt, but Homer and his pals do face considerable obstacles before reaching this destination. This type of emotional tale does require us to accept a certain level of corniness, but Hickam and writer Lewis Colick (Ladder 49) keep these moments from becoming too prominent. The characters remain human and their ideas seem realistic, which adds considerable weight to their struggle. The story�s success also stems from an excellent group of actors, starting with Gyllenhaal, who makes Homer�s wide-eyed enthusiasm believable. The other boys all perform well, especially Chris Owen as the nerdy and extremely intelligent Quentin. Chris Cooper perfectly combines the admirable and difficult qualities of the father, who easily could have become a typical movie character. Dern is also surprisingly effective and makes Miss Riley�s difficult plight entirely understandable. Director Joe Johnston (Hidalgo, The Rocketeer) specializes in old-style Hollywood pictures that some may label too sentimental. However, he seems to find a way to keep his characters grounded in reality and make them compelling. Working from a modest budget, he helped to make October Sky a surprise hit with both critics and audiences. By staying true to the story�s real-life origins, the Johnston and Colick weave a gripping tale that should inspire viewers of all ages. The characters achieve great things through diligence and a fierce desire for learning, which a positive lesson for everyone. Image Transfer Review: October Sky utilizes an extremely clear 2.35:1 anamorphic widescreen transfer that presents the mining town of Coalwood wonderfully. Few defects exist on the print, and the black levels remain solid throughout the presentation. This is one of the cleanest transfers that I've seen in a significant time, and it deserves a high recommendation. Audio Transfer Review: This disc provides the options of choosing between 5.1-channel Dolby Digital and DTS transfers, and neither is disappointing. The DTS track is especially clear and offers a more complex mix, but the Dolby Digital one also utilizes significant power. The test rockets shoot all across the sound field, and the clanging sounds of the coal mine resonate well through the rear speakers. 1 Feature/Episode commentary by Homer Hickam, Jr. This 31-minute feature brings together all the original guys who lived the events of the movie. Homer Hickam offers the most input and really seems to enjoy discussing his teenage life. The best moments involve shots of his actual hometown, along with some old photographs and videos. They also bring back the old school principal and the only living father in the bunch to recount the tale. It�s surprising to learn how similar the filmed story is to the actual reality of the boys� exploits. The other highlight of this release is a feature-length commentary from the real Homer Hickam, portrayed by Jake Gyllenhaal in the picture. He also wrote the book Rocket Boys on which the film was based, and exhibits tremendous enthusiasm. Hickam discusses the differences between the film and reality, including the compression of time from three years to one year that was necessary for dramatic impact. This track is definitely worthwhile for viewers interested in the historical background of the movie. Included with the original DVD release, this 10-minute promotional featurette�s only saving grace is Hickam�s inclusion. However, this piece is unnecessary since he provides much more information on the other documentary. The director, actors, and others discuss the basic story, which leads to a dull, predictable experience. These text pages offer a consider amount of detail about this production, though most of it is the basic overview material. Nothing here is groundbreaking, but it should be helpful for viewers not interested in the commentary or documentary. Along with the preview for the feature presentation, this disc includes pre-menu trailers for The Motorcycle Diaries, Friday Night Lights, Miami Vice: Season One, and Ray. I'm generally not a proponent of studios releasing a film multiple times, but Homer Hickam's involvement makes this special edition a worthy release. Supported by top-notch audio and video transfers and an attractive list price, this disc earns a recommendation.